used to contain the second stuffings. Here at the Brass Tacks shop, we hold an ever-changing collection of pattern books for you to browse. If you're looking for a specific fabric, just let us know and we'll try to source it for you, or browse our collection of quality fabrics. We also have a vast range of contract fabrics suitable for pubs, hotels and offices, where the demand for a higher specification is required. Then, at the other end of the scale, we have soft wools and cashmeres. 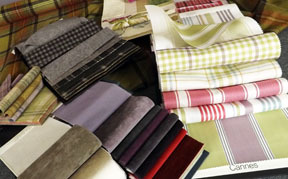 We also offer advice on choosing the right fabric for your requirements. Please see our upholstery services page to find out more.